Lips and cheeks get the pretty young thing treatment. Cremesheen Glass makes its comeback with six exciting new shades and three requested bring-backs! Add Mineralize Blush duos and Lip Pencils to delight and define. All Too Fabulous! When I first read about this collection nothing really wowed me and I had no plans to get anything from it. I've tried a Mineralize Eyeshadow in the past and didn't really like it so I've been put off trying any of M.A.C's other Mineralize products. 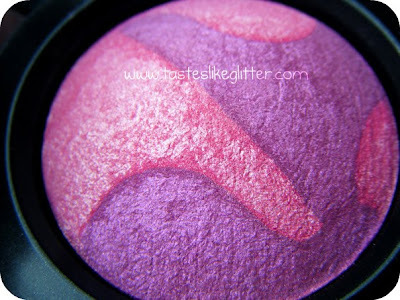 Since I've only been using M.A.C's Well Dressed Blush I thought it was about time I got something different. So opted for a Mineralize Blush. 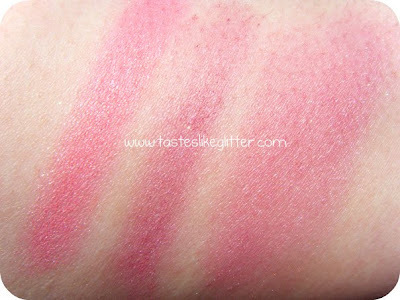 (Heavily swatched for review purposes). Two Virutes is a light blue pink with light violet swirled into it. It seemed like the obvious choice, considering it had purple in it. The majority of Mineralize products have some form of glitter or shimmer in them (think MSFs), so I was expecting this to be really sparkly. It isn't and I'm glad about that. If you look at in the pan there is noticeable shimmer but when applied with a light hand it leaves a beautiful sheen to the skin, almost like a glow. Not too sparkly, not too matte. The overall colour payoff is amazing. I find when using Well Dressed it can take a good swirl around the pan to get enough colour to show up on the cheeks, so yesterday without thinking, I did the same with this, applied it to my cheek and realised just how pigmented it was. I had to buff it out with a fluffy brush for quite some time. The clown look really doesn't do it for me. ;) I find the pink is definitely more pigmented then the violet, but when used together the violet makes the pink seem a lot more cooler. I'm actually really glad I purchased this, it's long lasting, smooth and has great colour payoff. I think the whole collection was really very pretty. It wasn't too out there but I think there's something in the collection for everyone. The Mineralize Blush and Lipliners are of course, limited edition. Whereas all of the Cremesheen Glass are being made permanent. I don't own yet but I may have to try one or two in the near future. Did you pick up or are you planning to get anything from this collection? Or is there nothing that caught your eye? Let me know.